The hidden cost of donated computer equipment is TIME. We are very fortunate to have a community that thinks about us when their offices are getting new equipment. 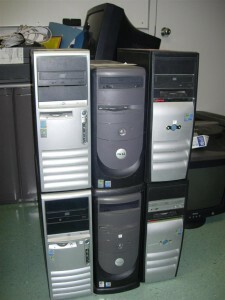 Often parents of students at the school will convince their workplace to donate unwanted computer hardware to the school. This is how we acquired the recent donation of monitors. Today, I am looking at a group of computer towers. there is a hidden cost to computer donations. I thank the parent for their generosity. It is very kind of them to think of the school. I smile on the outside, but inside I sigh. WOW! This is going to be so much work! I wheel the donations down the hallway. Once in the office I assess the situation. The towers are all different models. It appears that a few of them have had parts replaced (video cards, network cards and sound cards). Oh and did I mention, the hard drives have all been wiped clean? The hidden cost to computer donations is the time it takes to get them ready for use. This job is literally going to take me HOURS. Not only do I have to format the hard drive but I also have to search for drivers after finding out the type of cards that are installed. This is LOTS of work! In the end, it took me at least 8 hours solid to bring one machine back to life. I had to first install the operating system with all its service packs and updates. Then I needed to install all the software, get all the updates, add printers, customize the registry, and join the domain. Let’s hope the school gets at least 3 years of use out of this equipment. It was lots of work to get these machines up and running. But they are much better than the old machines. Speaking of which, I need to recycle them. What are Other Hidden Costs to Computer Donations? Are computer donations really free? What are the hidden costs? Do the benefits of the donation outweigh the hidden costs?